This enhanced satellite image made available by NOAA shows Tropical Storm Florence, upper left, in the Atlantic Ocean on Tuesday, Sept. 1, 2018 at 3:30 p.m. EDT. 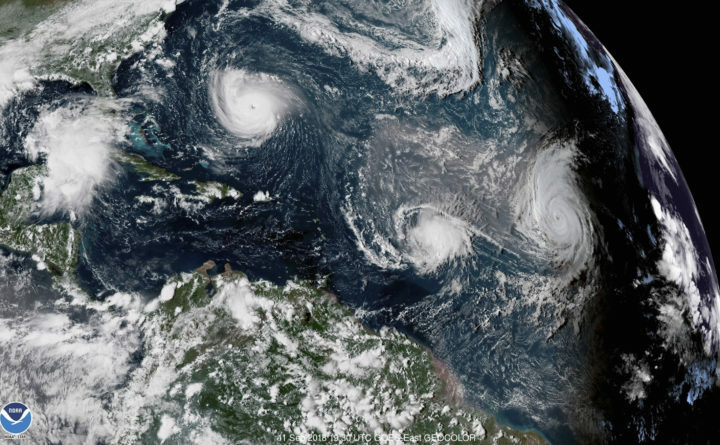 At center is Tropical Storm Isaac and at right is Hurricane Helene. WILMINGTON, N.C. — Motorists streamed inland on highways converted to one-way evacuation routes Tuesday as about 1.7 million people in three states were warned to get out of the way of Hurricane Florence, a hair-raising storm taking dead aim at the Carolinas with 130 mph winds and potentially ruinous rains.